Citizens Advice Bureaux deliver frontline advice services in over 280 service points across the country, from city centres to island communities. CAB record the issues that clients present with when they seek advice. 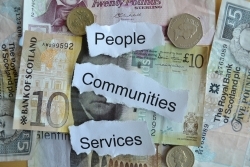 This gives the Scottish CAB service a unique insight into how policies, practices, and processes are impacting on people in local communities across the country. The CAB Service has over 2,300 highly skilled volunteers who donate their time to the service, this creates over £10 million in value every year in volunteer hours.